The pie chart below shows the percentage of ad spending by different kinds of media in India from 2012 to 2017. 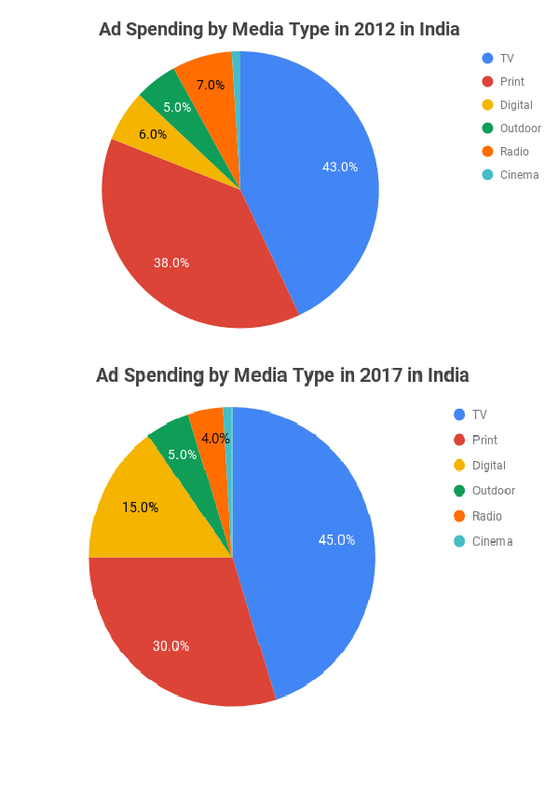 The pie charts illustrate the change in advertisement spending over six types of media, TV print, digital, outdoor, radio and cinema, for two separate years in India. Overall, television remained the most popular medium to advertise over five years, although there was little change in expenditure. On the other hand, there were significant shifts in the proportion of ad expenditure for digital and print, while other forms of media experienced little change. The percentage of advertising spending on television advertising was 43% in 2012 and this increased only marginally to 45% in 2017. Digital media expenditure, on the other hand, more than doubled to 15% over the two years to the detriment of print media which fell sharply to just under a third at 30%. Regarding other media types, the proportion of spending on radio ads almost halved to 4% in 2017, whereas outdoor and cinema remained the same at 5% and 1% respectively, with cinema being the least popular medium to advertise in. The first comparison shows little change for TV ad spending, while the second contrast highlights the shift from print media to digital, all the while showing that other traditional media types experience little change. Discuss marginal increase in TV advertising over the two years since this represents the biggest proportion of total ad spending in both years. Moving on to digital media expenditure, use “doubled” rather than “increase” or “rose” to show variation in your lexical resource. Print media ad expenditure fell while that of digital media grew, so we can use a new phrase here “to the detriment of” which means that one suffers because of another. Use adverbs with each verb to explain accurately the shifts in money spent. Introduce the purpose of the paragraph with an introduction phrase. Use “whereas” to show a concession and “with” to add information. The pie chart illustration the change in advertisement spend over six type of media, TV print, digital, outdoor, radio and cinema, for two separate years in India. Overall television remain most popular medium to advertisement over five years although there was little change in expenditure. On the other hand, there are significant shifts in the proportion of ad expenditure for digital and print, while other form of media experienced little change. The percentage of advertising spending in television advertising was 43% in 2012 and this increased only marginally to 45% in 2017. Digital media expendature, on the other hand, more than doubled to 15% over the two years to detriment of print media which falling sharply to just under a third at 30%. Regarding other media types, the proportion of spending in radio ad almost half to 4% in 2017 whereas outdoor and cinema remained the same at 5% and 1% respectively with cinema being the least popular medium to advertisment in. Overall, television remained the most popular medium to advertise over five years although there was little change in expenditure. On the other hand, there were significant shifts in the proportion of ad expenditure for digital and print, while other forms of media experienced little change. Look at the 2012 and 2017 pie charts. Where are the similarities and differences between the two? How can information in each pie chart be grouped together? How does TV ad spending change? What about digital and print? Look at other advertising mediums. How does spending on advertisements change in relation to radio, cinema and outdoors?